The third in our Work Personality series, this piece covers the subversive Snake. In 30 years of working with a wide variety of businesses, we have developed a simple model of four kinds of people found in organisations. The first type are the most common in organizations. They are the dependable deliverers. They are reliable but somewhat passive, consistently doing good work once they are clear about what is expected. And they have the best interests of the organization at heart. In animal terms you might see these as the faithful sheep dogs – ready and willing to follow wherever they are led. Another type of Work Personality are those individuals who deliver just about enough to prevent themselves from being fired but contribute little to drive the business or ensure its success. Perhaps in animal terms they would be regarded as sloths – exerting themselves only to find enough food to survive. There are very few types who are genuine initiators. They are able and inventive, looking for ways to drive the business forward. Without these people, the business will struggle. 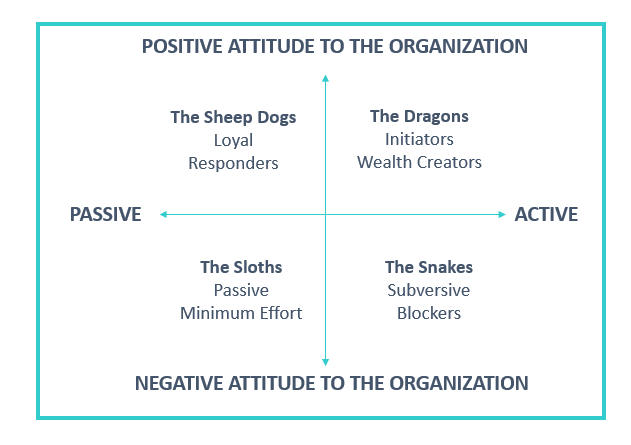 In a previous article we described this Work Personality, the dragon, who are tough, task focused and driven to succeed. Rarely, but consistently, we come across individuals whose aim is to harm the organization that employs them; this is the fourth Work Personality. 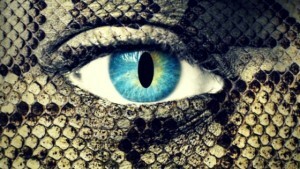 Just like the mythical view of the snake, these people are deceitful, vengeful, vindictive and sly. The identity of these people and their negative impact may be well known by HR and other senior people in the organisation but they are clever, devious, cunning. Because there is little evidence to convict them of subversive behavior, they tend to be moved sideways or upwards rather than out and so get to infect even more of the organisation. They should be dealt with firmly and swiftly but rarely are. What sorts of things do these subversive snakes do? You might ask James, a Snake whose subversive nature is unknown to you, to research some information that you need to make an important presentation. You ask this on Wednesday and need the information Monday morning. When you come into work on Monday, the information is not there and James is away on holiday. Your presentation, without the essential data, is a disaster. When James returns the next week you ask him what happened. His reply: ‘Oh, sorry! I left a post- it note on your desk on Thursday to say that I was not going to be able to get the stuff together in time and suggesting that you ask Jane instead. Didn’t you see my note? Maybe the cleaners threw it away!’ Of course you did not see it because it never existed, but you now have the reputation of being badly prepared for important presentations. a typical Snake excuse for not doing what you requested ‘Oh, sorry! I did not get your e-mail.’ Of course he did, but chose to ignore it. How do people become Snakes? There are three routes: the psychopathic personality, the severely stressed, and the disaffected. Many business leaders are among the most talented, commendable and well-intentioned people. However, our research indicates that occasionally, psychopathic personalities achieve a leadership role. These people have huge potential to damage the organisation and should be removed firmly and swiftly, but this rarely happens. The psychopathic personality is narcissistic, egocentric and lacking in remorse or concern for others. They can also be charismatic, captivating and clever at manipulation. Such people who rise to the top in business are able to ‘empathize’ with others. They can ‘read people’ and identify their motives, needs, susceptibilities and vulnerability. This might sound very positive but the psychopath then uses this insight not to support but to destroy the individual and potentially the firm – for the enjoyment of the exercise of power over others. They are excellent ‘role players’ – able to give an impression totally at odds with their intentions and to modify their approach to exploit the situation and turn it to their advantage. The third largest UK consultancy partnership in its sector appointed a new Chairman. He was charming, appeared accomplished and vowed to develop the partnership into a world class organisation. He even came highly recommended from a similar organisation. Within six months, he created a culture of uncertainty and ultimately fear. In partnership meetings he was charming, gave praise and recognition for the achievements of members of his team, and praised the activities of employees lower down in the organisation. Over time, it became apparent that he frequently praised individuals who had not done a good job. At first this was seen as encouraging, supporting someone to do better but gradually it was realised that at times his comments were sarcastic. At other times, his positive remarks about poor performers irritated those who had made strong efforts to correct the mistakes of these poor performers. The rest of the partners identified the need for a new senior partner, and with the help of hfi’s assessment they identified a very capable, strategic leader named Steve, two levels below the partnership level. The Chairman ridiculed the idea that such a person could lead the partnership and championed his own candidate: a middle of the road, operationally focused person called George whom the Chairman knew well. George was assessed by hfi and pronounced unfit for the role, but the organisation appointed him anyways and became the lap dog of the Chairman. He also rapidly became stressed, as he was not capable of performing at the required level and had to take sick leave for six months. The performance of the organisation began to drop. Steve left to found his own company and within three years had a turnover rate that exceeded the highest turnover ever achieved by his former employees. As the partnership lost business, the partners were required to put in substantial sums of money from their private income to keep it afloat. At this point, the Chairman left. Within three years the partnership no longer existed. Pressure can be enjoyable and energise resilient people to achieve a higher level of performance. Recent thinking has put emphasis on the beneficial aspects of stress – likening the stress response to the surge of Adrenalin occasioned by a roller coaster ride or the excitement of watching a good thriller. But long term stress is detrimental to health, well-being and performance. The least positive results in Engagement Surveys come from highly stressed individuals. This kind of stress destroys an individual’s well-being. 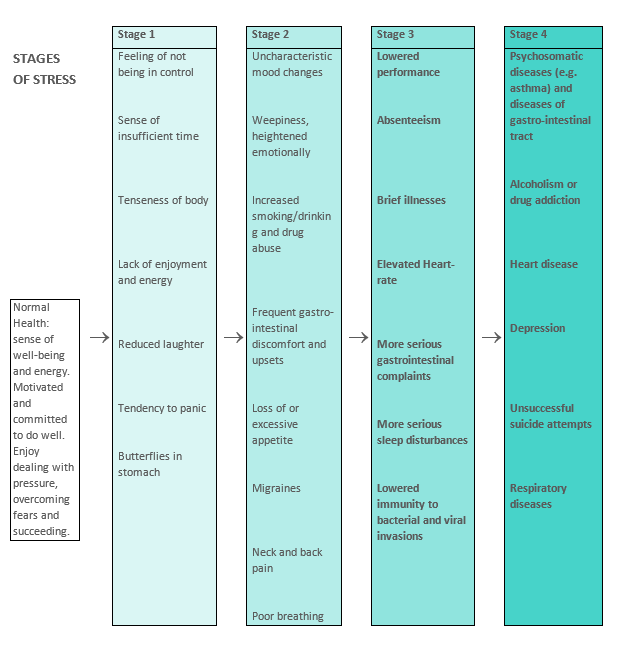 The Snake’s subversive response kicks in at about Stage 3 when energizing pressure becomes debilitating stress. This is when commitment becomes a vindictive desire for revenge on the organisation that is blamed for causing this stress. Straight thinking is distorted and leads to inappropriate decision making. The disaffected subversive is the third kind of the Snake Work Personality. Former high performers become disaffected if they are passed over for promotion, if their ideas are rejected or if they do not receive the reward and recognition that they expect. The HR Director of this global company knew hfi well and suggested that we should assess the Board before deciding to sack CEO to see if there was another reason why the company was not doing so well. The outcome of that assessment was that the CEO was excellent. However, he had been appointed from outside the organisation when the current COO had applied for the role and been turned down for a second time. This brought the subversive determined Work Personality out of a good performer to prove that the chosen CEO was no good, and he was unconcerned about destroying the company in doing so. The COO’s method was to promote individuals that he knew were incompetent into key roles and then sit back and see how the CEO would cope with a useless team. The Chairman sacked the COO and his protégées, retained the CEO, and recruited a new COO and a new team (all assessed by hfi for their suitability). Within six months productivity was up and they sold the company within a year for twice what they had been offered 18 months before. How many subversive work personalities are there in most companies? Our findings over a period of over 30 years, suggest that in most companies subversive Snakes make up about 2% of the organisation. In an organization which is failing, this number rises significantly. Our findings are backed up by research carried out in 2010 by Paul Babiak, Robert Hare and Craig Neumann (Snakes in Suits). They had the opportunity to examine subversive work personality tendencies in a sample of 203 individuals from numerous companies’ management development programs. The research showed that approximately 3% of those assessed in this management development program study scored in the subversive range. How can we guard against hiring or promoting subversive Snakes? Use objective, data driven assessment methods such as psychometrics for both recruitment and promotion. These give detailed and reliable information about capability, potential performance and the motivation and character of a candidate. Do not rely on interviews where candidates can impress with their personal charm and persuasive communications skills – they could well be a Snake! Utilise a robust unified talent acquisition and talent management framework to underpin recruitment, development and succession planning decisions. When hiring from the outside focus on real substantive accomplishments that can be verified – more than on personal charm and force of personality. Be sure there is a solid foundation of actual accomplishment to support all claims. And if you do get Snakes – don’t step on them, find a swift way to remove them!!! The best way to spot a Snake before you hire them is an hfi assessment.  Contact us today to start using our world class psychometrics for your talent management needs. Check out the Dragon and Teddy Bear articles, and stay tuned for more installments in the Work Personality series.